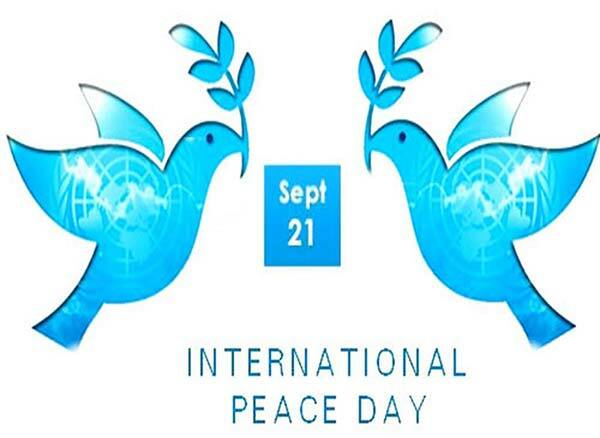 The 21st of September will be International Day of Peace. It may seem a little premature to declare that world peace is due to break out by the end this month. I do not deny that the amount of killing and death and war and torture and death and coercion and abuse and death all over everywhere can be overwhelming. Nor do I deny that considering this it is a natural assumption to believe people are sinners, destined for extinction. However, I do argue that compassion is as much a part of human nature as cruelty. Following World War I citizens in the USA successfully campaigned for a pact which renounced the use of war as an instrument of national policy. It remains on the statutes and was signed by several other countries. This commitment may not have lasted, but inspiration can be found elsewhere. For example, the states of Costa Rica and Panama have no official armies and the town of Marinaleda, Spain, has no police. Dennis Morgan of The Centre for Global Nonkilling comments that smaller pockets of resistance to killing narratives exist in organic farming or permaculture communities (PDF), which, when linked up ‘can represent a nucleus of a non-killing world.’ Dieter Duhm of Tamera similarly believes intentional communities can act as models for a ‘Future without War.’ Such places have become mainstream, for example The Global Ecovillage Network, Findhorn Foundation and Auroville have all worked with the UN, and Transition Towns have attracted academic attention. The motivation to organise rests on the belief that we can cooperate. In 1989 UNESCO demonstrated this with the adoption of the Seville Statement, which announced an understanding of the potential of human nature to adapt and flourish with peaceful nurturing from society and through childhood. Charles Darwin too believed animals such as humans have a natural capacity to feel empathy, behave altruistically and experience apleasurableandmeaningfulexistence. Whether or not we express the capacityisinfluencedbyexternalfactors. Cultural change could open us to becoming more peaceful still. 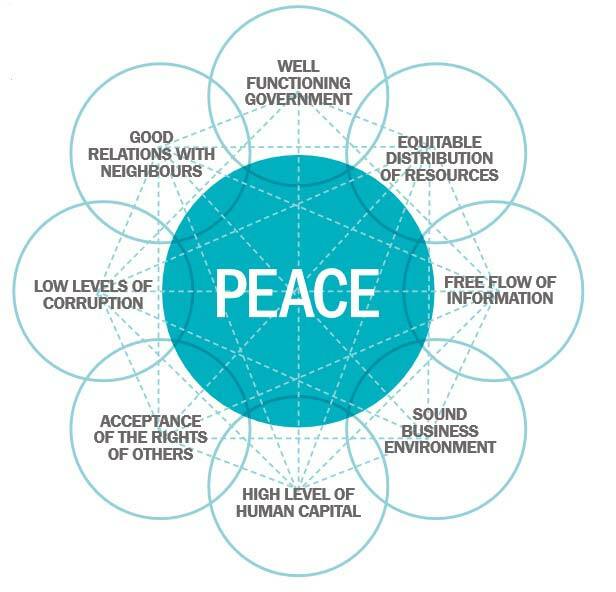 Our surroundings are beginning to change for the better; the United Nations General Assembly, has also adopted annual resolutions in support of a ‘culture of peace’ since 1997. One cultural change is the number of countries abolishing state-sponsored execution, which has doubled, from 48 in 1991 to 97 today. It has been found that a major shift may be occurring in the basis of human thought and discourse. On an individual level for example, around 20% of Europeans have been found to deeply care about "ecology and saving the planet, about relationships, peace, social justice, self-actualization, spirituality and self-expression". It has even been said that there is an "explosion in empathetic behaviour." A symptom of the change may be seen in the growing appetite for plant based diets; around 10% of the population of Israel, Sweden, Italy, and Germany, are now vegetarian or vegan. Will Tuttle explains in World Peace Diet how peace among humans is influenced by peaceful behaviour towards nonhuman animals. Farms did not always exist in their present form, and indeed did not always exist at all. Changed farming systems is given as one factor which normalised institutional killing in a human species which had previously lived predominantly without killing. The Centre for Global Nonkilling has produced several books which explain how it is possible to bring about a world without war. In ‘Nonkillng Futures’ (PDF), Dennis Morgan finds that it is now common among academics to believe human civilisations have existed which did not demonstrate signs of organised violence. Evidence suggests the likelihood that there was no organised violence among humans between at least 5000 and 7000 years ago, or even longer. In more recent history, Georgia Kelly from the Praxis Peace Institute explains (PDF) that the city state of Dubrovnik, Croatia, was consciously created in the 1200s to be a state which would not engage in warfare. It accomplished the span of its six hundred year existence in peace. Hunter-gatherer societies rarely engage in war. 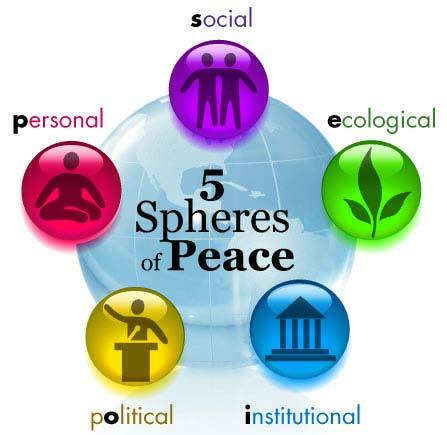 The website Peaceful Societies describes highly peaceful societies which exist around the world, some hunter-gatherer and others not. The populations range in number from hundreds to thousands. While their characteristics vary, the societies tend not to glorify leadership or individualism, and all have convictions in nonviolence. It has also been found that more equal societies have less homicide. Our society could become more peaceful if resources are distributed more equally, and children are not raised to believe that war in inevitable. Morgan adds that it is "only when humans learn to live in harmony with their environment and each other that the principles of nonviolence can be activated in a very real way. In such an environment, killing becomes unthinkable." 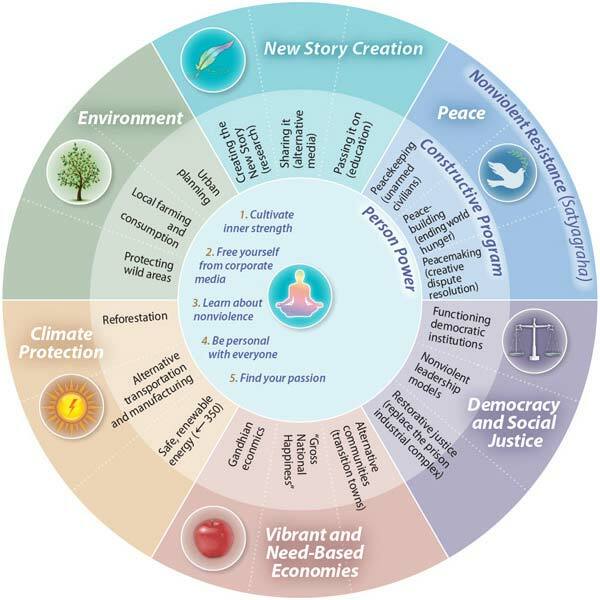 In the Metta Centre report Michael Nagler identifies (PDF) souls such as Jesus, Buddha, Gandhi and King as ‘beacons of what is to come’, since they demonstrate to us that it is possible to settle conflicts amicably, and to expand our consciousness to cherish all beings. However, nonviolent conflicts do not need to have charismatic leaders, as demonstrated by the democracy movement in Serbia. Where there are leaders these are supported by the persistence of other activists, such as in Bashah Khan’s 100,000 nonviolent soldiers and countless other people we usually have not even heard of. Peace is made between non famous individuals on a daily basis. Beyond Right and Wrong and The Forgiveness Toolbox document moving stories from people who found strength in justice and forgiveness. The references here suggest that different expressions of violence are related. For example, acceptance of interpersonal relationship violence relates to state sanctioned violence, such as militarisation and corporal punishment. Untangling such a complex web will not be easy, and can only be approached from all sides. This means that different types of contributions are all useful, and, as the evidence also shows us, people power has achieved a lot already. The idea that violence is inevitable is normalised through childhood socialisation and depressing media narratives, which teach us to accept coercion, competition and authority. On the other hand, listening to uplifting stories inspires positive action, and reminds you that you are not struggling alone, Permaculture News is a good place to find such stories. It is isolating and disempowering to believe that humans are bad for one another and the planet. We are interconnected. Nature is neither negative nor positive. It is not dualistic or linear. It does not progress, but evolve. On September 11th, when many people died in the blazing inferno at the World Trade Center, so did many illusions. Among them was the American sense of invulnerability, protected by the world's two largest oceans, blessed with a large continent filled with natural resources. Over the two centuries of our national life, we Americans have developed a feeling of safety, of optimism and of confidence. With the exception of our own Civil War, Americans have always felt that the terrible things taking place in distant lands couldn't happen here. There were of course, in just the last few decades, other attacks on our country-even on the World Trade Center itself-but none ever pierced our feeling of invulnerability. September 11th did that. It exposed, in a violent and a tragic way, the reality that in today's world, there is no place that is immune to terror. The immediate worldwide outpouring of sympathy for Americans was heartening, but it soon gave way to a more complex reality. Because societies, like individuals, are complicated mixtures of high ideals and base instincts, they can simultaneously admire and, resent love and hate. People around the world are drawn to, and inspired by, our nation's basic values: the primacy of individual liberty, the concept of equal justice under law and the aspiration of fair opportunities for every member of society. At the same time, many people around the world disagree with some of our policies, while others resent what they believe to be American exploitation or indifference to their plights. And there are those to whom we are an inevitable target simply because of our place in the world. Throughout human history there have been dominant military powers and dominant economic powers. Despite its initial distrust of foreign entanglement, despite the reluctance of the American people, the United States has been thrust to the center of the world's stage. That role brings with it enormous benefits, but also many problems. In this era of instant communication, every problem in the world is seen by someone as an "American" problem. Every grievance, no matter how local, whether real or imagined, can be a cause for resentment of the dominant power. Another illusion that was buried in the rubble of the World Trade Center was that the United States could go it alone. Withdrawing from multi-lateral efforts, not paying our dues at the United Nations, repudiating treaties that we entered into: all of those actions were wrong in and of themselves and shortsighted, not in our self-interest. It is obvious that we cannot deal with every problem alone. Indeed given our place in the world, it is in our national interest to encourage the involvement of others in solving our common problems. Recently, I was in South Korea and I met with the president, the prime minister and the legislative leaders. As you know, there are 37,000 American troops there pursuant to a mutual security treaty between our two countries. President Kim told me that the government and the people of South Korea support the continued presence of American troops in their country. In the past few years, I have met with government and political leaders from every country in Europe, from Ireland to Russia, from Finland to the Mediterranean Sea. I asked each of them this question, now that the Soviet Union no longer exists and Russia has withdrawn its military forces back to its own territory: Do you believe that the United States should withdraw its military forces back to our own territory? Without exception the answer was an immediate and emphatic no. Now I referred earlier to dominant powers. Think back through history and try to recall a dominant power with so much moral authority that other countries all around the world asked for our military forces to be stationed on their soil. Why is that? Obviously part of it lies in power itself. But I am concerned for the many Americans, especially for young Americans who have never known anything else, who perceive power, economic and military, to be the exclusive basis of American influence in the world. I think there is more to it. While clearly important, power is secondary to our basic ideals: individual liberty, equal justice and opportunity for all. That always has been, and continues to be, the primary basis of American influence in the world. And I ask you and all Americans to never forget that the United States was a great nation long before it was a great military or economic power. When there were fewer than four million Americans clinging to the Atlantic seaboard, this was a great nation, ennobled by the Declaration of Independence and the adoption of the American Constitution. These charter documents and especially the Bill of Rights, the first ten amendments to the Constitution, are the most eloquent and concise statements of individual liberty ever written and adopted by human beings. There have been and there will continue to be times when it is necessary to use force to defend our liberty, to protect our citizens. But we must do so in a manner that is consistent with our fundamental values and we must, at the same time continue without pause or hesitation, to search for peace, justice and security in the world. In Northern Ireland, in the Middle East and in the Balkans, we have worked to promote peace and security, unfortunately with limited success. In Northern Ireland an unprecedented agreement for peace was reached in 1998; when I had the privilege to announce the agreement, I described it as an historic step, which it was. But I also said that by itself that agreement does not provide or guarantee peace and stability. It makes them possible, but many difficult decisions remain and the outcome is, even now, not assured. In the Balkans, we rightly were criticized for the long delay between the onset of violence and our response. Yet once we acted, we helped bring the violence to an end and to replace a brutal dictator. But once again, a successful outcome is not assured. In the Middle East, we have had even less success. Despite an intense effort, President Clinton was unable to resolve the differences between Israelis and Palestinians. And notwithstanding the efforts of the Bush administration, the cycle of fear, hatred and violence accelerates. We must not be deterred by the apparent lack of progress. To the contrary, we must intensify our efforts. A just resolution to the Israeli-Palestinian conflict is the right objective for them, for us, for the world. That was true before September 11th, it is even more true today. Earlier I referred to the many countries that want American troops on their soil. I am sure that many of you at that moment thought of other countries that do not want our troops, where some express, everyday, in public and in sometimes violent demonstrations, their hostility to our country. Although many troops are in Muslim countries, President Bush has rightly made clear that Islam is not our enemy. The Muslim world is not monolithic; the countries there are many and varied with different ethnic, linguistic, religious and political heritages. Their economic and political interests frequently diverge and they have fought many wars among themselves. We could make it a self-fulfilling prophecy if we assume their hostility and think of them and act toward them as one. What they have in common, for the most part, is the absence of democracy, growing populations, stagnant economies and widespread poverty. What they most need is more organization and growth in their economies, the creation of jobs, the generation of hope and optimism among their peoples. We must be sensitive and we must address these realities if we are to have any hope of a more peaceful world. Recently I was asked a question: Is world peace an impossible dream? I would like to conclude these remarks by trying to answer that question. Now it may seem like the wrong time to talk about peace in the world with reports of war filling the air. 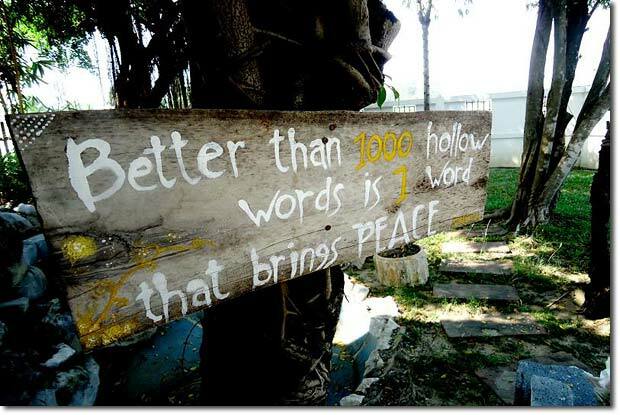 But if we wait for the day that nothing bad happens in the world, we may never even get to talk about peace. So I'd like to say a few words on that subject. If by world peace, it is meant the complete absence of conflict among and within nations, then it may well be impossible. There are more than six billion people in the world; current estimates project an increase to between eight and ten billion in this century, with the largest increases to occur in the poorest countries. There will be a huge and rising demand for land, for water, for natural resources of all kinds, for jobs and opportunity, for political and economic power. As the gap between the rich and the poor nations widens, and as the technology of killing advances and spreads, it is unrealistic to imagine the complete absence of conflict. But if by world peace we mean the absence of a major war and the effective containment of regional conflicts, I believe that to be entirely feasible. The remarkable ingenuity of humans, especially of free men and free women in societies, has been repeatedly demonstrated. Throughout history at almost any point in time, a negative forecast was justified, and yet over time progress has been steady and at sometimes spectacular. I believe that the direction of human history is toward more knowledge, more freedom and more broadly shared prosperity. Just look at our own national experience. I referred earlier to our Constitution. It is, to me, one of the greatest literary and political accomplishments in history. And yet, great as were the men who wrote it, they were products of their time, constrained by the society in which they learned and lived. And so our Constitution, which we rightly revere, limited the right to vote to adult white men who owned property. Black persons were not even considered to be persons under the American Constitution. It took 75 years and the bloodiest war in our history to extend the right to vote to all adult males. It took another 60 years and a long and bitter struggle to extend it women. And it was just a decade ago that Americans with disabilities, for the first time, obtained the legal right to live full and meaningful lives. To this day the struggle goes on to expand our definition of citizenship, of what it means when we talk about human and civil rights, which every American citizen should enjoy. Now that history is both a painful record and at the same time inspiring evidence about what's good about America-a never-ending effort to right the wrongs of the past, to enable each generation to be more free and more prosperous than its predecessors. And today we are more liberated and more prosperous than Americans have ever been. Now obviously what has happened here will not be duplicated precisely elsewhere. But we should be heartened by the knowledge that in a different way, at a different pace, the same journey has been underway in Europe, in part of Asia and in other lands-not all, not evenly and with many setbacks, but in the right direction. We are now living in what will be the first full century of American dominance in the world. It can be, like so many in the past, a century of war and famine, of oppression and injustice. But it also can be a time when the dominant power uses its strength and commits its people, its power and its prestige to a great and noble vision: a world that is largely at peace with education, opportunity and prosperity extending to more and more people to more and more parts of the world. As Americans, that is our challenge. As Americans we must make it our destiny. George Mitchell served in the United States Senate from 1980 to 1995. Upon leaving the Senate, he joined Verner, Liipfert, Bernhard, McPherson and Hand, where he currently serves as the firm's chairman. Recently, he served as chairman of the Peace Negotiations in Northern Ireland. George Mitchell Senator Mitchell also chaired an International Fact Finding Committee on violence in the Middle East. The committee's recommendation, widely known as The Mitchell Report, was adopted by the Bush Administration as its policy in the region and has been endorsed by the European Union and many other governments. On April 4, 2002 Senator Mitchell delivered a public lecture at the University of Michigan. The event was sponsored by the International Institute, CES, CMENAS, CREES, Office of the President, Office of the Provost and Executive Vice President for Academic Affairs.